This thread is intended to let everyone know which keyboards/mice you are using that have worked and which have not. This helps us find those non-compatible products and write firmware patches where possible. Corsair K95 Keyboard requires connecting an extra mini-USB cable between the KeyMander's power port and a USB power supply such as a charger for a smartphone or tablet. Connect the K95's main USB connector to the KeyMander, and leave the second USB connector unused. If you do not connect the power cable, you may experience random power loss (shutdown) of the KeyMander or possibly the game console as the current draw becomes too high for the single USB port. I really think this thread should be "What Keyboards and Mice Don't Work with KeyMander". Does it work with the Corsair K70 keyboard? Yes, I've tested both the K70 and the K95. The K70 works fine, just connect and play. The K95 requires a lot of current which is why is has two USB connections, so to use it you need to connect an extra mini-USB cable between the KeyMander's power port and a USB power supply such as a charger for a smartphone or tablet. Connect the K95's main USB connector to the KeyMander, and leave the second USB connector unused. If you do not connect the power cable, you may experience random power loss (shutdown) of the KeyMander or possibly the game console as the current draw becomes too high for the single USB port. I've been lurking around the Xim4 forums and users seem to recommend the Pixart 3310 and 3360 sensor. Does this hold true to the Keymander as well? I'm assuming a lot of their advice translates your product? P.S. I like you all better! Same performance, lower price, more friendly community! Keep up the good work! Thank you for the support! I can't speak for the rest of the team here, but I game with a PMW3310 optical sensor mouse (Kaliber Gaming RETIKAL Mouse) or the ADNS9800 laser sensor mouse (Kaliber Gaming FOKUS Mouse), and while they both work well for KeyMander, I have a small preference for the 3310. It mainly stems for the fact that some games (like Rainbow Six: Siege) have problems with the aim/look mechanics, and using a flawless sensor like the 3310 family keeps from introducing smoothing issues, etc. when trying to aim accurately at far way/small targets. 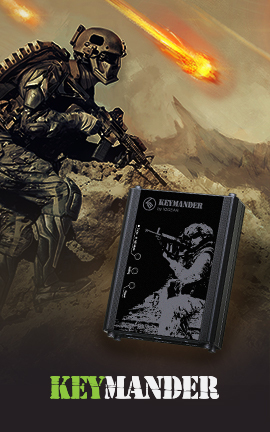 However, high dpi gamers will likely prefer the higher maximum resolution of laser sensors as they require less sensitivity boost in the KeyMander software, which yields smoother "steps" at the higher end of the sensitivity spectrum. It appears that it does not work with the Corsair Glaive. Just bought it today and tried using it and for some reason, while on the PS4, when I move the mouse, it acts like it's a keyboard. Any ideas before I return it back to the store? How does it work like a keyboard? Normally mice with compatibility problems have issues related to erratic response. Can you please provide more details? Kind of a moot point now as I purchased the G502 from logitech and it works like a charm - which was a week ago. What I meant was every time I would move the mouse while connected to the keymander and PS4, the physical mouse movements were registering like I was pressing the keyboard. For instance, if I moved the mouse in a down ward movement, the PS4 would act like I pressed the "C" key on the keyboard, making my player crouch. Mind you, all my keymander profile settings were in place prior to me purchasing this mouse, and I just upgraded from an older mouse I was using. Another instance would be if I would move the mouse in the left direction, the PS4 would read that as me pressing the "ESC" key on the keyboard, and would take me out of game and into the PS4 menu. I didn't track all the specifics - those are just off the top of my head. Although initially disappointing, I'm happy that I was able to go back and buy a $35 mouse that works like a champ. So in summary, I don't think the Corsair Glaive is compatible at the moment. Thank you very much for the information! I will order the Glaive ASAP and have our engineers test it. Yeah i bought the corsair glaive aswell and have the same exact issue. Will have to return and exchange im glad the information is posted here. I keep having issues with my Logitech G600 mouse. When i turn on the console and first use it in play mode from PC it works fine. After about 5 min the mouse starts moving on the screen on its own and i have no control. Do you know the cause of this? Does this only happen through Playmode or does it also occur when going directly to the keymander? 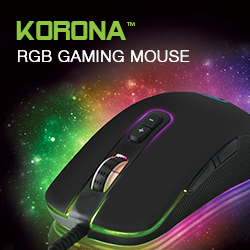 Do you have another mouse you can try through playmode instead of the G600? Also do you have drivers installed on your PC for the mouse? Yes i tried the Razer Deathadd and does the same thing. Also yes drivers for mouse are installed. Only works when i plug straight into the keymander. Just thinking about getting the Logitech wireless gaming mouse. Try deleting the software file and re downloading it, just make sure to export any profiles you have to make sure you can import them again. Did that solve your problem? If not, try deleting your mouse driver and see if the problem still exists if you are using Play Mode. Normally this is caused by having deadzone set too small and your controller having a little controller droop, but if it doesn't happen while directly connected to the KeyMander, it may be caused by something inside the mouse driver conflicting with the software. Let us know what you find out. OK thanks Derek. I will try this out tomorrow and let you know. Hey Derek i tried all the above and nothing seems to work. Would a Razer Naga Epic wireless mouse work with the keymander if i plug it straight in and use it the wireless way instead of wired? If it only works correctly when connected directly to KeyMander, there is something on the PC causing as conflict with the KeyMander software. Sometimes mouse drivers can cause delays or other unwanted operation, but it really is hard to know the source of the problem. I would go through your Task Manager and look at running processes. Start closing non-essential processes until you find the conflict. What operating system are you running and what PC/processor? I just got a razer naga epic wireless mouse, And it works so far with it wireless when plugged straight into the keymander. Haven't spent a good amount of time testing it for a long period yet. But I am running windows 10, the new fall update and cpu is a Ryzen 7 1700. I wanted to use a wireless mouse with my setup anyway. Just have to let the mouse charge and test it to see if it gives me any problems. Will let you know. Thanks for your help. We just received t the Naga Chroma for testing, so please let us know if you find anything odd. Well this is the old epic version. Was using it but the acceleration is to slow. Meaning when I go to turn it turns slow. Other than that it has no issues. Anyone know if the RAZER TURRET works? We have not tested the Turret at this time. Does the Logitech G203 Prodigy Mouse work? I haven't tested that mouse yet but I looked it up and it looks like a simple wired mouse. Very rare do Logitech keyboards not work with the Keymander, but if you run into any issues let me know.